Bahuleyan Charitable Foundation India Limited BCF is a non-profitable company, incorporated under Section 25 of the Indian Companies Act, with the objective of providing medical, educational, and community development for the public in general. Established by Dr. Kumar Bahuleyan, BCF has been providing selfless service to the poor and destitute people in the villages of Kottayam District, Kerala. Over the years BCF has been of great help to the public especially the poor and weaker section of the society providing medical aid, educational aid etc. Many destitute people have benefited by this noble venture. To continue the good work, more funds are needed. We request any organization or individual to come in support of this organization & contribute to a noble cause. All BCF activities qualify as CSR (Corporate Social Responsibility) under the Indian Company´s Act and also for deduction under Sec. 80 of the Indian Income Tax Act. Whatever contributions that you make by way of cash, kind or voluntary service will go a long way for helping the poor and uphold a noble cause. Your donations will change lives! You can contribute to any of our projects. 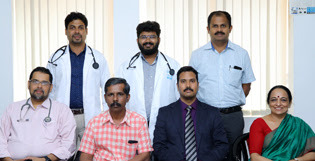 Indo American Hospital was established under the aegis of Bahuleyan Charitable Foundation India Limited, based in Kottayam, Kerala. It was incepted on the vision of Dr. Kumar Bahuleyan, an eminent Neuro Surgeon –just because one man thought that he could make a difference to this world by his actions. The Hospital has been providing yeomen service to the poor and weaker sections of the society. As per the wishes of its founder, being a charitable organization dedicated to quality of service, the charges in the hospital are also kept low and affordable so that even the poorest of the poor can come and get the best treatment. Due to this policy, the hospital is in need of funds for refurbishing our infrastructure and to keep abreast of the changing technology in medical science to be able to continue with our aim of providing world class service to the poor at the cost which they can afford to pay. You could either donate for the overall development of this institution or be a sponsor of any one of the hundreds of major brain and spine surgeries that we do in our hospital every month for the poor and needy who do not have the money to pay their bill or buy the medicines they need. Donations can be made to the hospital towards research and for the benefit of poor patients. All contributions are exempted under the Indian Company´s Act and also for deduction under Sec. 80 of the Indian Income Tax Act. Contribute now and make a positive difference!